Would you like to make a huge difference in healthcare? Look for opportunities to provide atraumatic care in your setting. This isn’t hard, in fact, it can be fun! Atraumatic care is defined in Wong’s Nursing Care of Infants and Children as “care that minimizes the psychologic and physical stress that health promotion and illness can inflict.” (p. vii). Dr. Donna Wong was a passionate advocate of atraumatic care, a primary focus of her approach in pediatric nursing. As a child life specialist, this was my focus, as well, so we frequently talked about ways to decrease stress in the healthcare environment. When we work in a hospital or clinic, we are often desensitized to ways in which those places might be difficult for a patient or their family. Being aware of this, then taking practical steps for minimizing the stress gives space for the patient to focus on their health. 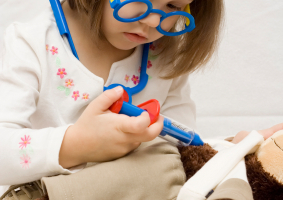 For example, when I was a child life specialist, I often used medical play to better understand the child’s perception of what was happening around them. Children would play with dolls or puppets and act out some of the procedures or experiences they had or would be having. During these times, as well as over a riveting game of Candy Land or Battleship, we could talk about their experiences and dispel any myths they had, while increasing their knowledge of what was happening around them and to them. Unfamiliar sounds were frequently a topic of conversation. One boy was concerned about the “ghosts” he heard in the walls at night. We were able to explore that a bit together and discover what sounded like ghosts was the elevator next to his room. The sounds of the elevator were drowned out by the day’s activities, but at night, they were very concerning to him. In fact, my friend and colleague, Victoria Fridley, did a fun project at the University of California, Davis Medical Center (UCDMC) in Sacramento. She asked pediatric patients what they heard, sounds they may have had trouble identifying when they first arrived at the hospital. They created a great list, everything from blood pressure cuff removal to monitors beeping to floor cleaning machines. A sound professional recorded all the sounds and we used the recordings at a Grand Rounds for doctors and nurses to listen and guess what they were hearing. The project increased our awareness of the sounds we took for granted that might increase anxiety for patients who had no context for the sound. 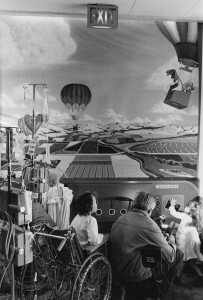 Another way we approached atraumatic care was giving surgical patients and their families tours of the operating and recovery rooms, so they could see what happened on the other side of the swinging doors. They could learn what to expect and ask questions about what they didn’t understand. They were prepared for questions, like “When was the last time you had something to eat or drink?” Many hospitals have videos to walk patients and families through this process and other procedures, which is a wonderful way to deliver atraumatic care, when actual tours are not practical. When my cousin was preparing to go through chemotherapy and radiation to treat her newly diagnosed cancer, she was very purposeful in creating a healing environment in her home. She made a playlist of music that she knew would be encouraging. She anticipated her needs and arranged to have the people around her to provide support. She chose essential oils that would help with relaxation, nausea, and pain. There were some rules. People couldn’t watch the news or anything negative on television in her presence. Television was for comedy only, like Gilmore Girls and I Love Lucy! The treatment was horrendous, but she had created a wonderful space to heal. That is atraumatic care, as well. It just makes sense that giving people information that can equip and empower them for a healthcare experience would reduce stress and give them more energy to focus on healing, rather than fear. Thoughtful communication is essential when reducing distress in the healthcare environment. A leading expert in this area is Michelle Rathman. You can find out more about her work at Impact! or listen to her story in our FACES of Pain Care – Episode 3. Attention to the design of the environment can reduce stress. 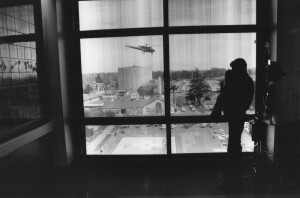 When Victoria and I were working together at UCDMC, there was a window at the end of the pediatrics floor where people loved to go watch the medical helicopter take off and land. 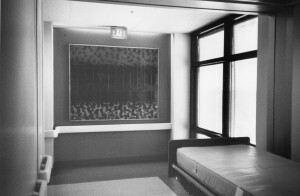 It was a gathering place for children, parents, and staff, but sometimes beds and other equipment not currently needed were there, as well. Victoria successfully wrote for grant money to enhance that area. A designer spent 24 hours in the space, watching how it was used, then created this beautiful design of the inside of a helicopter cockpit that was enjoyed for years. What is stressful to you when you go into a new situation? Where do you park? How do you find where you are going in the maze of a hospital? What are they going to do to you when you get there? And what if the news is exactly what you are dreading? Every procedure and event can be viewed through the lens of atraumatic care. Are families able to be with their children? Are procedures explained in a way that the patient understands what is going to be happening? Is the patient warm enough? Do they feel someone will respond when they need help? Are you able to provide competent care while promoting self-esteem and preventing embarrassment? I recommend referring to Wong’s Nursing Care of Infants and Children 10th edition by Marilyn J. Hockenberry, PhD, RN, PPCNP-BC, FAAN, and the late David Wilson, MS, RNC-NIC, a valued member of our foundation board for many years. In this comprehensive book, boxes with information about atraumatic care for virtually every scenario is included. Comments? We would love to hear about the great things you are doing to provide atraumatic care. We want to hear your stories. If you would like to send us photos to possibly add to this area of our website, please email us at info@WongBakerFACES.org.